Separated by a 2+ hour drive, Orlando and St. Augustine are worlds apart. Sprawling Orlando grew around the magic of Disney. 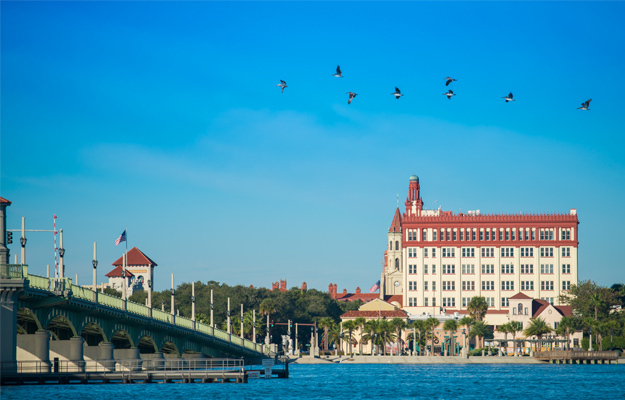 Tiny St. Augustine has been a continuous community since it was settled by Spanish explorers in 1565. Spectacular attractions at Disney World and other venues are an escape into never-never land. Ancient forts, brick streets and an amazing collection of historic buildings in America’s Oldest City are a fascinating walk through history. The drive from Orlando to St. Augustine is straightforward interstate travel. Leave early and stay late to avoid some of Orlando’s congestion. If you want to take a detour along the way, Daytona Beach, home of Daytona International Speedway, is at the juncture of I-4 and I-95. Avid race fans may opt to give up time in St. Augustine to tour the home the Daytona 500. For others, a drive around the outer grounds and a taking selfies at the iconic Daytona International sign may be enough. St. Augustine is small. On-street parking is limited. Park for a fee in the Visitor Information Center and walk everywhere. Or, head straight to the Old Town Trolley Tour complex on San Marco Avenue where parking is free with the purchase of a tour ticket. If you park at the Visitor Information Center, Center, many historic sites, museums and architecturally interesting historic gems within walking distance. 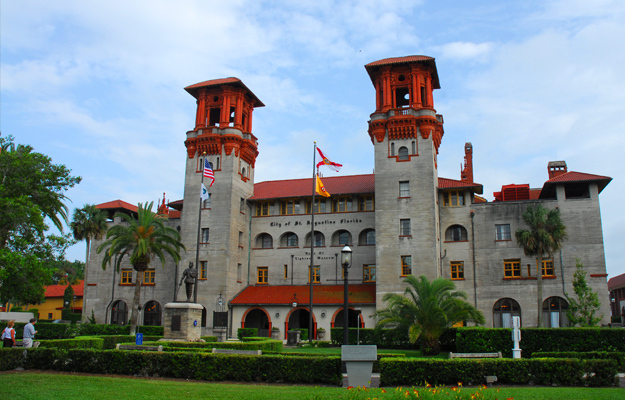 Other interesting sites and St. Augustine’s beautiful beaches are not within walking distance. You’ll need a car to drive to the Old Jail, Fountain of Youth, the Shrine of Our Lady of La Leche, the Old Jail, Alligator Farm and the Lighthouse. If you park at the Old Town Trolley complex, purchase your tickets ahead through Trusted Tours & Attractions, check in and hop on the trolley for an interesting tour with the convenience of hopping off to explore at any of 23 stops. 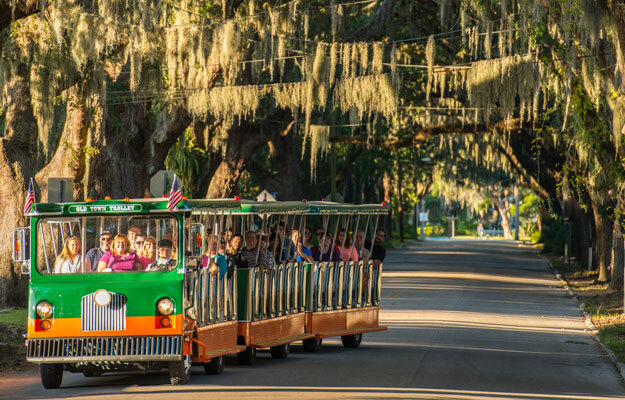 A bonus: the ticket includes free admission to small Florida Heritage Museum within the complex and a transfer pass to the St. Augustine Beach Trolley. Also in the compound: the must-see Old Jail, the Oldest Store, snack food and restrooms. Many historic sites and attractions are great for kids. Others are favored by visitors traveling without kids. Check out the choices below and pick out those that appeal to you. Allow 45 min to 90 minutes for each. Cool forts. Explore fort casements on a self-guided tour of Castillo de San Marcos, the oldest masonry fort in continental U.S. Built by the Spanish between 1672 and 695 as a walled defense line around the settlement, on-sites exhibits, a video and occasional cannon and musket firings are interesting. Park Rangers are onsite to answer questions and give occasional talks. Pretending to be a Pirates. Don’t miss the Pirates & Treasure Museum, a kids’ favorite. Engaging interactive exhibits and activities, and tons of authentic artifacts creatively tell the story of those dastardly opportunists lurking at sea. Selfies with celebs. Older kids and teenagers have a blast in Potters Wax Museum taking selfies with celebrities and legendary figures, even though they are made of wax. The museum is small and the broad selection of wax figures allows for great close-up encounters. Watching artists at work creating the figures is fun too. Anything with a creepy factor. Kids find the small Spanish Military Hospital Museum either cool or creepy. Attention-grabbing “demonstrations” of Spanish Colonial period surgical instruments, treatments, herbal medicines are great for both adult and kids. The Old Jail is creepy and scary. Being inside what was once an actual jail with cells still intact, and hearing stories of what went on inside is fascinating and entertaining. It’s a must for anyone over 6 years old who doesn’t mind an occasional scare. Alligator encounters. Seeing an alligator tops any kid’s list. 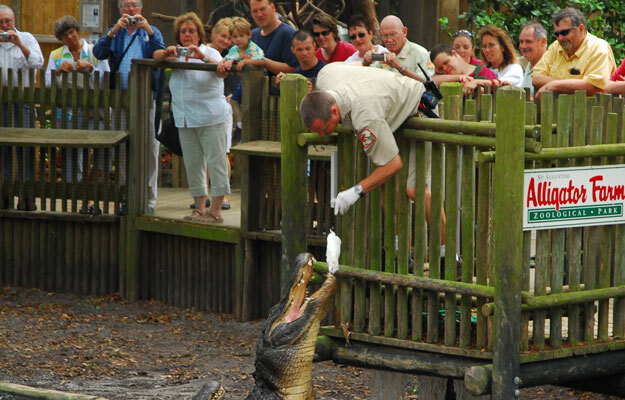 In addition to alligators, Alligator Farm & Zoological Park has wading birds, lemurs, pythons and fossils; exotic birds, native reptiles, giant tortoises. Older kids could spend all day traveling above crocodiles and roosting birds on the thrilling Zipline. Taking a boat ride. Kids of all ages are thrilled to get out on the water. The 90 min. Birding and Nature Boat Cruise is a great ride through the unique tidal marsh ecosystem filled with wading birds, sea creatures and an occasional bottlenose dolphin. Departing from Municipal Pier, it’s an awesome outing. The old world ambiance of historic St. George Street. Pass through historic City Gates for a stroll down 11 blocks of the pedestrian-only St. George Street. Look beyond the streams of tourists meandering down the street, popping in and out shops, restaurants and attractions to notice the quaint, Spanish-influenced details of the building, many with overhanging balconies. Touring historic house museums. The details and simplicity of the furnished rooms in the Ximenez Fatio House, a boarding house catering to St. Augustine’s first visitors, provides interesting insight into life in the active town. The Oldest House Museum is a lovely walled property in one of the oldest sections of the historic district. The house is a fine example residential life in First Spanish and British Periods. Furnishings and artifacts on each floor define the difference. Experiencing the Gilded Age. In contrast to Spanish and British period houses, the museums in the Gilded Age Triangle are immersions into the opulent lifestyle of St. Augustine’s wealthy residents and tourists in the late 1800s. The Lightner Museum is the largest. Its collection of eclectic and fine decorative 19th century art, artifacts, curios, antiques, furnishings, Tiffany stained glass, Egyptian mummies and taxidermy is extensive. Make lunch in Café Alcazar, located in what was once the hotel’s indoor swimming pool, part of the experience. Catch a glimpse of the eccentric tastes of St. Augustine’s Gilded Age residents in small Villa Zorayda, distinctive inside and out. Furnishings, art and unusual curios from the private collections gathered during exotic travels of two of its original owners are fascinatingly eclectic. Exterior photos are all you might be able to get of the magnificent former Ponce de Leon Hotel, now part of the Florida College campus. Tours of the fabulous interior are limited to times when classes are not in session. Walking an archaeological dig site. Although the legendary fountain draws the curious visitor to Fountain of Youth Archaeological Park, several outdoor exhibits on the expansive waterfront property are interesting for history buffs. Walk through a replica Tumucuan village, check out the layout of what is thought to have been the first Spanish settlement, and climb the lookout tower, precursor of the lighthouses, for a fabulous view of the marshes and beyond. Cruising along the waterfront. Take 90 minutes for a cruise along the town’s quaint waterfront and through tidal estuaries on Scenic St. Augustine Boat Cruise departing from Municipal Marina. Chilling out. Give your feet a break and your taste buds a treat at the San Sebastian Winery, which creates vintage varietals from Florida-grown hybrid and Muscadine grapes. Free guided tours and tastings are offered throughout the day. Chill on the rooftop at The Cellar Upstairs Wine and Jazz & Blues Bar for live music, tasty appetizers and a selection of San Sebastian wines.